-Pathophysiology: Glenohumeral dislocation. Usually occurs with indirect force applied to the shoulder through the arm during abduction and external rotation, leading to the humeral head slipping out of the glenoid fossa. -Workup: Most important is history and physical. Shoulder x-ray in three planes (AP, lateral, axillary) is the initial imaging modality of choice. -As with any MSK injury, be sure to do a neurovascular check distal to the dislocation, including the axillary nerve innervation of cutaneous deltoid distribution. If vascular or neurological deficits are identified, more rapid reduction is required. -Complications: Bankart’s lesions and Hill-Sach’s deformities. While initial x-rays should pick them up, more subtle presentations may only be seen on CT or MRI. Also… most things here apply only to anterior shoulder dislocations. Posterior or inferior dislocations are less common and more prone to long-lasting complications. An ortho consult is always in order for these. 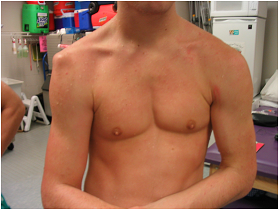 As mentioned above, the shoulder is most commonly dislocated joint. 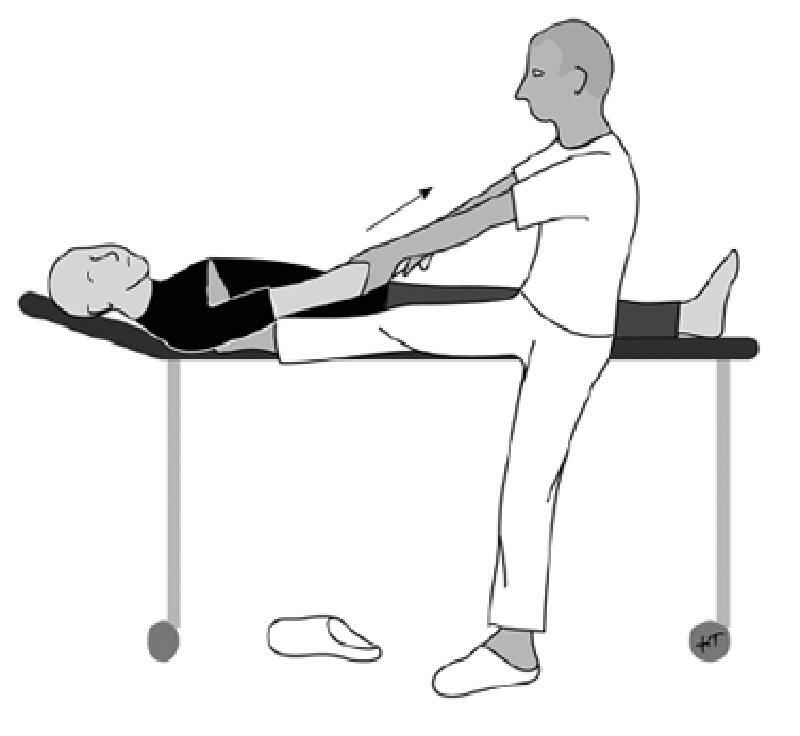 It’s the most mobile joint in the human body, but with great mobility comes great instability. As we can see in the image below, there’s not much keeping the humeral head nestled in the glenoid fossa besides soft tissue stabilizers like rotator cuff muscles, ligaments and the joint capsule. It is most commonly dislocated anteriorly via indirect pressure applied to the arm during abduction and extrinsic rotation. It can be sub-categorized based on where the humeral head ends up: subcoracoid, subglenoid (the two most common) or subclavicular or intrathoracic (both very rare). There is a bimodal distribution in the patient population seen with shoulder dislocations: young, active men and elderly women. Presentation: Patients typically come in with a history of trauma supporting their flexed, externally rotated arm. The shoulder will have a classic squared off appearance and a gap between the humeral head and the acromion can be palpated. Usually not the trickiest diagnosis, although the image below is dramatic. The goal of reduction is to restore pain-free, functional anatomy and range of motion while maintaining shoulder stability. In order to accomplish this, the muscular spasm which occurs during dislocation and keeps the humeral head from spontaneous reduction must be overcome to relocate the humeral head into the glenoid fossa. 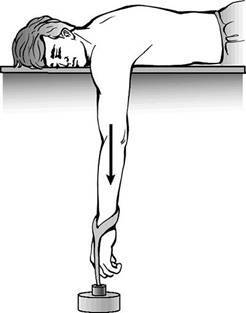 Forward elevation: arm initially is elevated 10 to 20 degrees in forward flexion and slight abduction. Forward flexion is continued until the arm is directly overhead. Abduction is increased, and outward traction is applied to complete the reduction. The patient is seated in a chair, and the affected arm is supported by the patient’s unaffected extremity. A 3-foot loop of stockinette is placed along the forearm with the elbow at 90 degrees. The patient sits up and gets some support from the physician. Traction is directed downward on the forearm by a foot in the loop, while the forearm is supported and the provider’s other hand is free for pressure or rotation as needed. Involves repositioning the glenoid fossa rather than the humeral head; can be used with minimal analgesia or muscle relaxation. 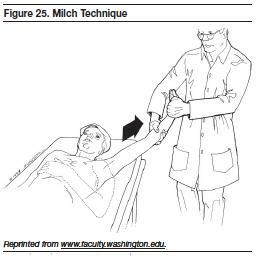 Traction on the arm is placed either by the hanging method or by an assistant. During gentle traction, the inferior tip of the scapula is rotated medially, while the superior portion of the scapula is stabilized. Procedural sedation with benzos, opiates, propofol, ketamine or etomidate has long been the mainstay for reductions in the ED. It’s common, providers are familiar with it, it can give some muscular relaxation and the patients are easy to work with, for obvious reasons. However, it is expensive and requires continual observation and cardiopulmonary monitoring during the course of the sedation. For those whose time and manpower is limited, intra-articular lidocaine injections have proven to be effective. For the horde of ultrasound enthusiasts, ultrasound-guided interscalene brachial plexus block can also provide effective regional anesthesia for reduction. Some advantages of these methods and avoiding procedural sedation are to reduce cardiopulmonary compromise, to reduce staffing required for monitoring, reduce ED length of stay, and reduce cost. There are some risks, well addressed elsewhere, of vascular puncture during injection and temporary phrenic or recurrent laryngeal nerve paresis, although this is operator dependent. 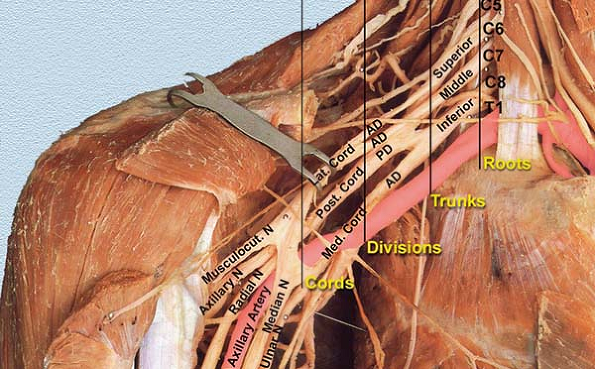 To rehash some basic anatomy, the brachial plexus runs from C5-T1, under the clavicle, to the axilla and provides innervation to the upper extremities. 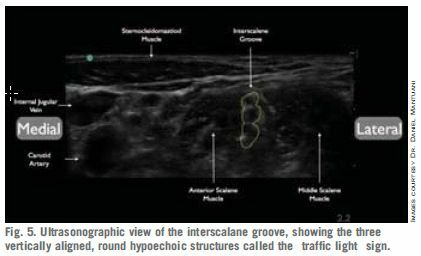 The interscalene block of the brachial plexus involves the infiltration of lidocaine at the level of the trunks, seen below, which when viewed in the transverse with ultrasound gives you the classic “traffic-light” sign of the three stacked nerve trunks. Neurological: axillary nerve, supplying motor innervation to teres minor and deltoid, and sensory innervation to lateral upper arm over the deltoid. 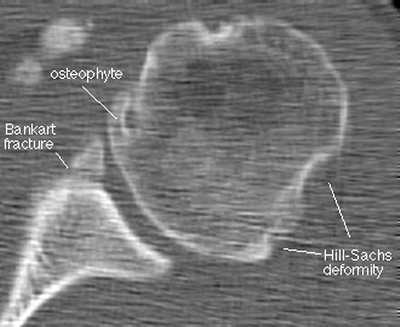 Joint instability and recurrent dislocation is the ultimate outcome for many of these complications, especially Hill-Sach’s, Bankart’s, and inferior glenohumeral ligament injury. All of these complications need an ortho consult, and surgical intervention can help prevent recurrence. For all you wilderness med maniacs out there, here’s a study published by the Wilderness Medical Society of a reduction method that can be done without assistance, equipment or medications. All it takes is patience and a willing patient.